Three summers ago, Deb and I took a vacation out west and split a week between Yellowstone and Grand Teton National Parks in Wyoming. Both parks are spectacular, each their own way. Of the two, my favorite was the Grand Tetons. Only later did I learn that, at one time, The Lutheran Church – Missouri Synod owned a sizeable piece of property right in the middle of the present park. It gave to property to the National Park Service for free – something that, from what I hear, some old-time Lutherans in the Wyoming District have not forgotten or forgiven the Synod for doing. The Episcopalians have always been much shrewder about these kinds of things than we Lutherans. They were given a piece of property in the Park on which to build a chapel which is there to this day. The “Chapel of the Transfiguration” was built to serve the employees of the local dude ranches in Moose, Wyoming. We visited it when we were there. It’s a rustic log cabin construction has a bell tower and wooden benches that seats about 60 people. The main attraction of the “Chapel of the Transfiguration” is the large window behind the altar which provides parishioners with a full view of the Grand Tetons and is meant to inspire a visual object lesson of the glory that the disciples saw when they saw Jesus transfigured on the mountain. No one is quite sure which mountain the Transfiguration took place on. One suggestion is Mount Hermon which rises to an altitude of 9000 feet above sea level. If that is true, it would mean that Jesus led the three up a mountain comparable to one of the Grand Tetons, which is quite the hike. A more likely prospect is Mount Tabor, just south of the Sea of Galilee. The summit of Mt. Tabor is only 1000 feet in elevation which doesn’t sound like much of a mountain unless that area of the region of Galilee were like Nebraska or Iowa which would make it a sizeable mountain indeed. If you think about it, even if the Transfiguration had happened in the most ordinary and drab ‘suburbia’ on earth, it would become the highest and most glorious spot on the earth because of what happened to Jesus there. Whether the mountain was 9000 or just 1000 feet high, for those few minutes, the summit was touching heaven itself. Anyone who has ever seen the Grand Tetons and then wants to tell someone else what they have seen understands the dilemma that the gospel writers have in describing the Transfiguration. For some things, there are simply no words to describe what has been seen. Any three people who see the Tetons will all most certainly describe it differently. Luke says, “the appearance of His face was altered and His clothing became dazzling white.” (Lk. 9:29). John, who was actually there doesn’t even try to describe what he saw, saying only, “We beheld His glory, glory as of the only Son from the Father, full of grace and truth.” (Jn. 1:14). Interesting. If we hadn’t FIRST been told that “Jesus was transfigured,” we’d have probably thought this was a description of what the disciples saw on Easter. Over the years, Peter has gotten a bad rap for recommending that the whole group should camp out here for a while and enjoy the scenery. But Peter has got it exactly right. For what Peter understands is that as he and his two friends came up the mountain from below, Moses and Elijah came down from heaven above. AND THE TWO MET IN JESUS. HEAVEN AND EARTH MET TOGETHER IN JESUS. And the Divine Liturgy, in which the saints on earth, with the saints in heaven meet together in the One Body of Jesus, the Son of God, was in full swing. And Peter didn’t want it to end. And if we had been there, we wouldn’t either. AND ONE DAY, IT WON’T. BUT FOR NOW IT MUST. But here on this mountain, the voice of God the Father is directed – NOT TO JESUS – but to the three disciples who are with Him. “This is my beloved Son; listen to him.” From His Transfiguration, Jesus would begin His journey to the cross. And it will be the disciples who will be repeatedly tempted to doubt HIS TRUE IDENTITY. And this is the significance of the Transfiguration of our Lord. From this high point where we see the glory of God in the face of Jesus Christ, we are given a peak across the deep valley of Lent and Holy Week to Easter Sunday. They who went up this mountain also come down this mountain. And in three days comes Ash Wednesday. And we will all follow Jesus to His suffering and death on the cross. The stunning view before our eyes on Ash Wednesday will be of the indescribable depravity of our life when measured against the light of God’s law and His love for us in His Son. From this valley that is shadowed in death we will once again be reminded of how temporary and transitory this world is and our own life is. We are dust, and regardless of what stage of life we are in, we are quickly headed back to dust. The Transfiguration of our Lord is the brief unmasking of the glory of God in Jesus that was masked with human flesh at His incarnation – and is ESPECIALLY masked as that human flesh is flogged and crucified on the cross. The main purpose of the Transfiguration of our Lord is NOT TO SHOW US WHAT WILL BECOME OF THIS CRUCIFIED CHRIST ON EASTER SUNDAY. But rather what we should see in this man as He hangs from the cross. As He hangs on the cross for ALL OUR SIN, IN OUR PLACE, ON OUR BEHALF, we see the glory of God in the blood streaked face of Jesus Christ. If you want to see what God’s glory is all about, if you want to see the BEATIFIC VISION, don’t look at the mountains and nature in all their splendor – because nothing in all of nature comes even close to revealing the glory of God. Only in the rejected, humiliated and tortured man from Nazareth in Galilee do we see the glory of God IN WHOM EARTH AND HEAVEN MEET. THE CROSS OF JESUS IS HEAVEN ITSELF – because the one crucified on that cross is the Son of God IN WHOM HEAVEN HAS COME DOWN TO US. So where shall we look for the glory of God? In the miracles? In the healing? In the way He answered my prayers? No. We look for the glory of God in the same place that St. Paul looks for it. “Far be it for me to glory except in the cross of our Lord Jesus Christ, by which the world has been crucified to me, and I to the world.” (Gal. 6:14). As we “listen to Him,” “the veil is removed.” “And we all, with unveiled face, beholding the glory of the Lord, are being transformed into the same image from one degree of glory to another.” (2 Cor. 3:18). It is Mark who shows us this “transformation from one degree of glory to another” in a most striking way. As we stand on the summit of this glorious mountain, we hear the voice of the Father proclaim, that this One who is so radiant that His clothes cannot hold His glory in, “Is my beloved Son.” That’s easy to hear and easy to believe on that mountain. Here is the miracle of true faith. 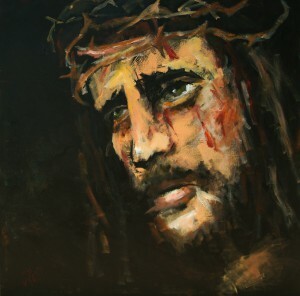 True faith confesses ONLY what God as already confessed – “This is my beloved Son.” As Jesus hung from the cross, this gentile Centurion, listened to all that He said from His wooden throne. And “the veil was removed.” And with unveiled face, he beheld the glory of the Lord, in the face of Christ, and Him crucified. As we listen to Him, the veil is lifted from our heart. And with unveiled face, we are marked with ashes that confess WHAT GOD HAS ALREADY CONFESSED – we are by nature sinful and unclean. But then we look at the CRUCIFIX and are again reminded that Jesus Christ – the Son of God – has fully atoned for our sin by His suffering and death – and we see the glory of God in the face of Christ – crucified. As we daily die to our sin by the Lenten disciplines of repentance and fasting and prayer and almsgiving, we die with our Lord. And by the power of His cross and hope of sharing in His glory, we are being transformed from one degree of glory to another. We are not allowed to stay on the summit of the Mount of Transfiguration. But we are allowed to stay – and must stay – at the foot of the cross. If you want to behold the glory of God – behold Christ crucified – He is uniting heaven and earth together in Himself.